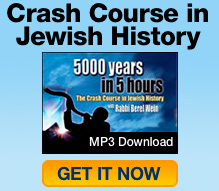 Crash Course in Jewish History by world renown Rabbi and historian Berel Wein. Rabbi Berel Wein,the founder and director of The Destiny Foundation since 1996, has, for over 25 years, been identified with the popularization of Jewish history through world-wide lectures, his more than 1,000 audiotapes, books, seminars, educational tours and, most recently, dramatic and documentary films. Rabbi Wein has authored four Jewish history books – Triumph of Survival, The Story of the Jews in the Modern Era; Herald of Destiny, the Medieval Era; Echoes of Glory, the Classical Era and Faith and Fate, the story of the Jews in the Twentieth Century – all of which have received popular and critical acclaim. Rabbi Wein also authors and edits a monthly newsletter – The Wein Press– a source of information and inspiration on topics of Jewish interest. He also pens a weekly column for The Jerusalem Post. Rabbi Wein, a member of the Illinois Bar Association, is the recipient of the Educator of the Year Award from The Covenant Foundation in 1993. Most recently, Rabbi Wein received the Torah Prize Award from Machon Harav Frank in Jerusalem for his achievements in teaching Torah and spreading Judaism throughout the world. Rabbi Wein makes his home in Jerusalem. thanks a lot rabbi. i`m 27 years old, and i`ve learnd for 9 years in a yeshiva here in israel, and i still enjoy your videos a lot and learn from them a lot. your lectures are a blessing of great knowlege and perseption. i think if you will add subtitles in hebrew, many more people would enjoy these videos. thanks again, and God bless you rabbi. How can I access these crash-course videos? jewish man great Rabbi Wein..
How can I upload all the videos on jewish history staring from #1?